Spectacular ocean view w/ Awesome sunsets. Partially covered private patio has fire pit & hot tub. Enjoy the ocean view from the living room & bedroom. Kitchen has breakfast bar, skylight & plentiful storage & counter space. Two car detached garage has workbench, shelving PLUS a bathroom/shower & separate water heater! 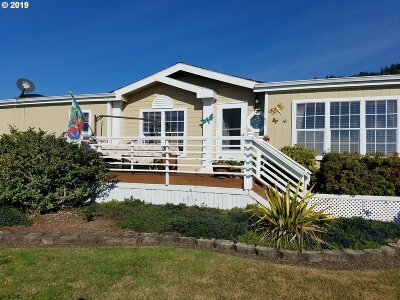 Driveway is large enough to park your RV and/or boat! Garden Flowers display an annual shower of brilliant colors!